There’s been no shortage of smartphone-based “augmented reality” apps to hit the market in recent years, but few have had the resources of a company like Google behind them — which makes the new invite-only cyber experience Ingress so intriguing. Initially teased with a mysterious “Niantic Project” website and videos that circulated around the Internet a few weeks ago, Google has now confirmed their involvement with the project and given their viral game an official name: Ingress. 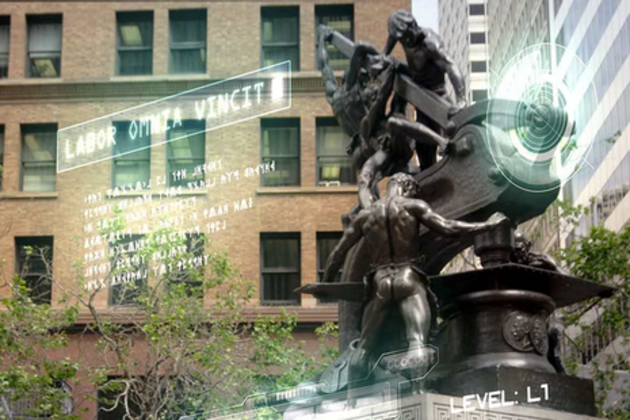 A mix of augmented-reality app, puzzle game, and geocaching with a team-based format that has players hunting for weird “portals” in the world around them, Ingress lets anyone with an Android smartphone participate in the game. At the moment, the game is invite-only, with invitations going out today for the first bunch of players. You can request an invitation at the Ingress website. Various reports describe the game as having some capture-the-flag elements to it, with players “hacking” the portals they find in their environment and capturing them for their team. Even when players aren’t out capturing portals, they can follow the action from their desktop using a global map that tracks all of the Ingress action around the world. Google has set up a support page for the game that outlines the basic strategy for Ingress, as well as troubleshooting tips, rules on harassment, and various cryptic explanations for exactly what is going in the mind-controlling conspiracy suggested by the game.